The house is quiet tonight. Our daughter Leah is in bed, and I’m still waiting for Ray to come home from Port-Au-Prince, Haiti from his medical missions trip there over the last two weeks. There are hardly any planes going into or coming out of Haiti (other than military planes), so he’s having trouble finding a plane to fly to Miami, FL, and then home to Kansas City, MO. The U.S. Coast Guard said that Haiti’s main port is more badly damaged than they realized, which is causing severe relief and reconstruction problems. The U.N. is supposedly delivering bags of rice or giving out coupons for bags of rice, according to the Washington Post. But currently there are a LOT of supplies of food, water, and medical supplies that are not being put into the hands of the people from bureaucrats, Ray said. When he and others in Haiti have requested supplies, they are told by the U.N. and other organizations that the supplies are being withheld “until a plan of distribution has been decided on.” Meanwhile, people in Haiti are suffering! I realize the problem of feeding all these hungry people is NOT an easy one, but surely more can be done. The best way to solve all of this is through the power of prayer. Today the story of Ray’s medical mission work in Haiti was on the front page, top of the page, in our town’s newspaper! A few of the facts were wrong, but overall it was good and it included Ray’s picture. Thank you, Jesus, for giving honor to Ray like this! Naturally I bought a bunch of copies to send family and friends, and excitedly told the cashier at the store that was MY husband on the front page, LOL! She recognized Ray’s picture and then proceeded to tell me that one time she had taken her husband to the hospital here in town, and that Ray was specifically requested by the hospital E.R. staff to put an IV in this man’s veins. The other medics (who are all really good medics!) were having a hard time getting the I.V. started. The patient did not have what paramedics call “good” veins, and starting I.V.’s is just something that Ray is really good at. (He’s been doing this for 20 years! He’s had LOTS of practice to poke people!). And Ray did successfully start the I.V. on this man. His wife woman told me, “He’s the best medic there!” Well, that made my night again! I am SO proud of him! “We are busy preparing for the next stage. While we are still in “survival” mode, we are beginning the “recovery” mode as well. These two phases will over lap for some time. Cleanup and prep for the third phase which is rebuilding. No food now in over five days! We have many promises but we quickly learned the truth of the old adage, “A bird in the hand is better than two in the bush.” Tomorrow we have a pretty solid lead on food, but until we have food on the property, we have no food. Soon, with your prayers! We are busy making ID badges for our tent city people. The day quickly approaches when we will have to move them off the property in preparation for our medical clinics that we will set up. This will move us out of the classrooms as we will begin full time classes for Morning Star on March 1st. The medical clinics will be a permanent fixture from here on out, offering medical care to the surrounding community. All the people who have been camped here will be able to return at any time and receive food and medical care after they leave. We will be giving them food, new shoes, toiletries, as well as plastic tarping. The rainy season will soon begin…we are racing the clock trying to get the new tent set up. Morning prayer is in full swing with over a thousand gathering. Church services have swelled to over 3,000 in just three weeks. Our clinic still treats over 100 people per day. Instead of serious injuries right after the quake we are treating people for malnutrition, diarrhea, parasites, and other issues. Disease is still a possibility as people live outdoors in close quaters and sanitation is a problem. We dug an outdoor latrine, but in the days leading up to that, people relieved themselves where they could. We hear reports of riots over food distribution, but we have seen the peace of God over our property. The airport is tightening down on security. Flights in and out remain hard to find. The port is yet to open and supplies are hard to come by. So far, we are holding our own, but if food and meds do not become more available, trouble could come. Please pray for the tent to be set up soon, for food, water, and supplies for them, and that Ray would be able to get on a plane soon to come home. I can’t wait to hear the stories about Haiti when he gets here, and to share them with you! I found this verse tonight in the psalms, and it reminded me so much of Ray’s, Shawn’s, and pastor Jay’s selfless, faithful work in Haiti for the last two weeks. To donate to Ray’s medical missions work in Haiti (which came out of our personal funds and through SEMSAR), click here. 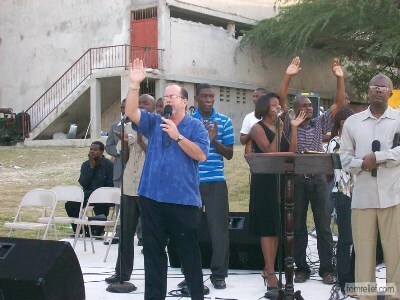 To donate to pastor Jay’s ongoing work in Haiti, click here.